My research focuses on the interface between behavioural ecology, evolutionary biology, genetics and population dynamics. For this, I combine behavioural observations, molecular tools and long-term data with the main biological model, the Alpine marmot, Marmota marmota. Why do some individuals live in couples, while others choose multiple genetic and social partners (partner change, extra-pair paternity)? Based on what criteria do individuals choose their social partner(s) and genetic partner(s)? How are these criteria evaluated? What are the costs and benefits of these choices at the individual level? What are the consequences for population genetic structure or population dynamics? In this context, my main research project currently focuses on partner choice for different genetic characteristics and the impact of choice on genetics and population dynamics. I am particularly interested in the consequences of mate choice for the evolution of genetic characteristics under selection, in particular on the evolution of major histocompatibility complex (MHC). This project builds on exceptional data, collected since 1990, on the population of Grande Sassière marmots; but also on data collected on different populations in the Alps and Pyrenees and during different time scales (contemporary, historical but also geological). It will quantify the role of mate choice in maintaining and promoting genetic diversity. Why do some individuals live alone while others live in complex social groups? Why do some become dominant while others remain subordinate? What are the costs and benefits of being dominant? What are the costs and benefits of being subordinate? What are the consequences of the size or composition of social groups? What are the consequences for the population genetic structure or population dynamics? In this context, I am currently interested in the consequences of the size and composition of social groups (1) on survival and reproductive success, and (2) on patterns of senescence in individuals who make up these groups. This project is based on both interspecific analysis of the mammals and on data from the population of Grande Sassière marmots. 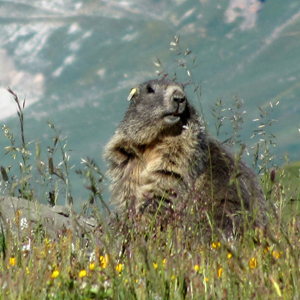 The Alpine marmot presents, in effect, a characteristic both fascinating and confusing: cooperative breeding. The Alpine marmot is thus characterized by the existence of social groups in which only the dominant pair reproduces, assisted by subordinates. These subordinates, although sexually mature are reproductively suppressed. They delay dispersion and instead help dominant individuals to raise their offspring. Such a social structure is expected to have important consequences for the life history traits, genetics and dynamics of the population. Why do some males develop extravagant secondary sexual characteristics (colours, weapons …)? Why do males develop some extravagant reproductive structures (disproportionate testicles, giant sperm …)? Do trade-offs exist between these traits? Do these traits coevolve with those of females? What are the roles of male competition and female choice in the evolution of these traits? Sexual selection acts on secondary sexual characteristics such as the characteristics of the gametes and reproductive systems of males and females. I am currently interested in the potential trade-offs between these different traits and factors that can influence these trade-offs such as the mating system or mating tactics. For this, I am particularly interested in rodents and ungulates on which both interspecific and intraspecific studies are conducted (in collaboration with ONCFS for the work on ungulates). How does climate change affect the survival and reproduction of individuals? What are the consequences for population dynamics? Which physiological and behavioural mechanisms at the individual level can explain the observed changes at the population level? What are the evolutionary processes involved in the response of species to climate change? Recent climate changes on Earth have consequences for the distribution, size and performance of many animal populations. Understanding the repercussions of climate change is essential if we want to predict outcomes for these animal populations. While many studies in birds have shown changes in species’ phenology, such as earlier breeding seasons, the examples of mammals are quite rare. In the context of this project, I am interested in determining how and what climatic factors affect different life history traits in the Alpine marmot. Plard F., Fay R., Kéry M., Cohas A., Schaub M. (2019) Integrated population model: A powerful tool to embed individual processes in population dynamics models. Ecology, in press. GREC-PACA (2018) Impacts du changement climatique et transition(s) dans les Alpes du Sud. Participation au cahier ‘Montagne’. Mourez J. (2018) Les marmottes étudiées de près pour 5 ans. Le Dauphiné Libéré, August 3rd. Investigacion y Ciencia (2017) Marmotas alpinas : El seguimiento de la especie en distintas zonas de alta montaña revela algunas de sus estrategias vitales. 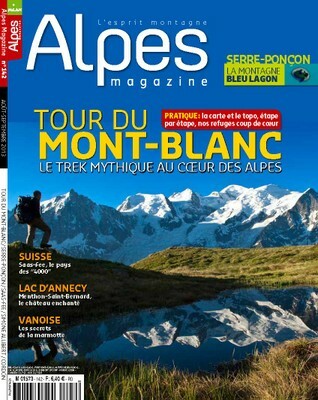 February n°485. Diari de Girona (2016) Un estudi conclou que les marmotes són infidels per evitar consanguinitat. May 31st. Diario de Pontevedra (2016) Las marmotas hembra son infieles para evitar la consanguinidad. May 31st. El Punt Avui (2016) Les marmotes s’assenten al Pirineu tot i la trava genètica . July 26th. La Vanguardia (2016) La marmota se acomoda en el Pireneo. July 24th. Diari de Girona (2016) La reintroducció de l’espècie fa que les marmotes colonitzin tot el Pirineu July 12th. ABC (2016) Constatan el éxito en la reintroducción de marmotas en el Pirineo. Heraldo (2016) Vuelven las marmotas alpinas a los Pirineos. July 11th. Efe Verde (2016) Constatan el éxito en la reintroducción de marmotas en el Pirineo. July 11th. Diari de Girona (2016) La reintroducció de l’espècie fa que les marmotes colonitzin tot el Pirineu. July 12th. Vilaweb (2016) La reintroducció de marmotes als Pirineus és tot un èxit malgrat la baixa diversitat genètica. July 11th. Ràdio La Seu (2016) La reintroducció de marmotes als Pirineus es consolida malgrat la baixa diversitat genètica. July 12th. Aldia.cat (2016) Les marmotes es reintrodueixen amb èxit als Pirineus tot i la baixa diversitat genètica. July 11th. UAB Divulga (2016) Reintroducing the alpine marmot into the Pyrenees . November 16th. La Vanguardia (2016) Las hembras de marmotas son infieles para evitar la consanguineidad May 30th. La Razon (2016) Hembras de marmota: infieles por una causa justa. May 30th. Efe Futuro (2016) Las hembras de marmotas son infieles para evitar la consanguineidad. May 30th. El Digital del Asuturias (2016) Las hembras de marmota son infieles con otros machos para evitar la consanguinidad. May 31st. Navarra Información (2016) Las hembras de marmotas son infieles para evitar la consanguineidad. May 31st. Andalucia información (2016)Las marmotas hembra le ponen los cuernos a sus parejas y con razon. May 30th. UAB (2016) Las hembras de marmota son infieles con otros machos. May 30th. Efe Verde (2016) Hembras de marmotas, infieles para evitar la consanguineidad. May 30th. TVE / La 2 (2016) La marmota infiel. May 30th. RAC 105 (2016) El fricandó matiner. June 3rd. Khamis H. (2014) A la découverte du mode de vie des marmottes. Radio Suisse Romande, August 25th. Reye B. 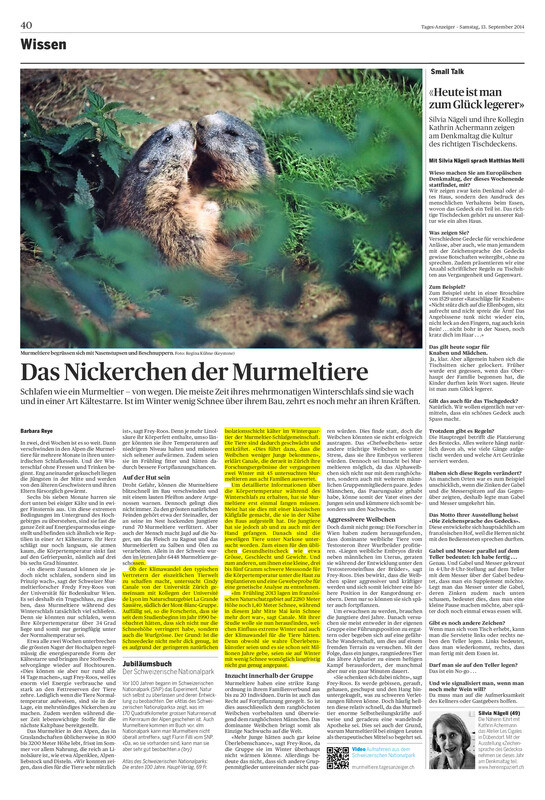 (2014) Das nickerchen der murmeltier. Tages-Anzeiger, September 13th. Kaplan M. (2007) Ain’t misbehaving. The Economist, 28 June 2007.